Why the Philippines is not in the list? The fact that the Philippines is considered the “Freest press in Asia” is enough to answer the title of this post. However, questions arise when we can hear reports about violence against members of the Philippine press. Do we really have a free press? 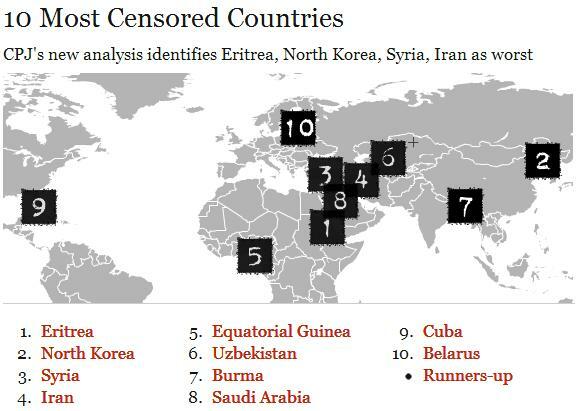 Let’s relate the basis of the New York-based Committee to Protect Journalists in coming out with the list of “the most censored countries” to the Philippine situation. This African nation has been always in the bottom of the World’s Press Freedom Index by the Reporters Without Borders (RSF) for denying foreign media to step on its soil. Local media in Eritrea is under closed direction by the Ministry of Information which provided the writers what angle of stories to pursue. Thus, it is not surprising it will also top in CPJ’s list. Philippines, in contrast is home to several correspondents of almost all international news agencies like Reuters, Agance France Press, Associated Press, CNN, etc. Most importantly, the nation still has independent editors who acted the real gatekeepers of the information in their respective outlet. This very secretive nation in Asia is always at the bottom five of the World Press Freedom Index and topped in the previous list of CPJ’s Most Censored Countries in 2006. Like Eritrea, the news that saw print are all feed by the government through the Korean Central News Agency. Crony Press – is the label given to media outlet that were supporting Marcos and the KBL party. Alternative Press – are those extremely critical to the Marcos regime and called for Marcos removal. Tabloid Press – are the yellow press or the tabloid. Censorship is at its highest lately in this middle-east country when political unrest escalated. The Syrian government has imposed news media blackout as it filtered the information coming out to the public. International media is also barred while citizen journalists are kept in the dark. This resulted its freedom index to drop heavily to the bottom four next to Eritrea, Turkmenistan, and North Korea from its previous last 6th place. Thank God, we are politically stable and there’s no civil war in the Philippines. The government of President Mahmoud Ahmadinejad is accused of censoring not only the traditional media but also the web using technology. Worst, the regime employs mass imprisonment of journalists to silence dissenting information. The Philippines is a lot better as citizen journalists like bloggers and other netizens are able to put online their works. Not one Filipino journalist today is in the prison cell for attacking the government. This African nation is reported for masquerading the true state of the nation by hiring public relations firms in the U.S. to produce positive news. It restricts foreign media to document anything about poverty. Local media are directly and indirectly controlled by the administration. Foreign media and observers including tourists are free to report what they saw in the Philippines. Remember the recent viral video–“20 Things I don’t like in the Philippines”. The Philippine government only responds to criticisms through the media and implement its own branding campaign like the latest MoreFunInThePhilippines tagline by the Department of Tourism. There is no independent media outlets in this country. Foreign journalists are denied visas and accreditation. Independent news websites and online broadcasters are inaccessible. The Philippines has government-controlled media but limited to radio and TV stations only. Though, not necessarily censored by the state but these state media have always engaged into reporting developmental news rather than following the practices of the mainstream media. Burma has a news censorship agency–Press Scrutiny and Registration Division which guards the military and the government from “poor” reports. Burma has released jailed journalists among its imprisoned political prisoners but the vast censorship structure remains intact. Owning a computer without a license in Burma is a crime and posting of unauthorized materials over the internet is banned. Foreign journalists are denied visas and the government will expel those who are caught reporting using tourism visas. In the Philippines, the only materials passed through government agency scrutiny are TV programs and films for reason of protecting audience. The Movie Television Review and Classification Board (MTRCB) doesn’t censor but classify TV shows and films for its appropriateness to various audience levels (PG, GP, GP-13, Rated R-18, X-Rated). X-Rated film has been banned in theaters for reason of morality since after Marcos administration. SM Cinemas imposed its self-censorship by refusing the screening of Rated R-18 films. R-18 films and X-Rated films are banned for television showing. 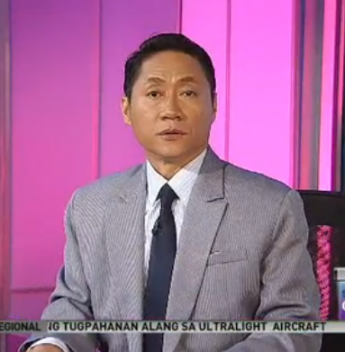 News programs are not subject to MTRCB review. Not even commercials shall pass government’s approval but subject to self-regulation by the group of advertising agencies. Government agencies can only appeal to advertisers to pull out objectionable ads like the one below. For health reasons, advertisements of liquor must carry warning for moderation drinking after the end of the ad while tobacco advertisement is now completely banned in all media platforms. It is for this reason of health and objectionable advertisements that i personally in favor of having a law on advertising rather than just having the Code of Ethics of some advertising groups as guide to responsible advertising (Why We Need an Advertising Code of the Philippines?). The Kingdom is unique itself as it is the only place to have an appointing power over the editors of traditional media. Authorities, at will, have the right to appoint and terminate editors as government imposes registration and approval of editors of the media organization. However, the criteria of the approval is vague. The same policy is now implemented by the Saudi government over the internet. Foreign media is also restricted from reporting the unrest at the Eastern Province. Except for the Philippine government-owned media networks, the choice of editors for any private media outlet is entirely the prerogative of the management. Usually, the choice for editors is based on seniority among the ranks paralleled with experience and knowledge. The communist party of Cuba controls the local news and the internet service providers are asked to block objectionable content. However, independent journalists and bloggers are given its way to work for overseas websites but can only perform their work through costly internet connections in hotels and embassies. Only selected foreign journalists are given visas while critical journalists are often the target of government’s smear campaign and persecution. Today in the Philippines, everyone seems a journalist on its own right. Online communities are active in reporting various happenings in their respective places while the gatekeeping role of the media has been reduced as far as the flow of information is concerned. This nation of extraordinary landscapes is described by the United States as the remaining “outpost of tyranny” in Europe. Being a journalist in this country requires an accreditation from government. Public Access to internet needs government-issued ID for the KGB to monitor it. Journalists here are subject to various persecution by government–from prosecuting to banning the travel of critical journalists. In the Philippines, the freedom of the press is not a privilege but a constitutional right. The constitution provides no space for any law to abridge this right. The media is making its self-regulation to its members by providing accreditation scheme in the case of broadcasters belonging to the Kapisanan ng mga Brodkaster sa Pilipinas. There’s an attempt to intrude in the editorial prerogative of the media by legislating the Right of Reply Bill which is heavily protested by various sectors not only the media. On the other hand, the media is assured of more access to information by the passage of the Freedom of Information Bill within this year . The general public remained protected from media abuse by means of the anti-defamation laws and the aging provisions on libel embodied in the Revised Penal Code. News sources are protected under the Press Freedom Law (Sotto Law) but this law needs to be updated to include the works of the broadcast and online journalists. way in which you assert it. You’re making it entertaining and you continue to care for to keep it smart. I can not wait to read much more from you. That is really a tremendous website.